Iris flicks the car’s headlights on, even though it’s not long past midday. There’s no rain yet, but you can feel it in the air, smell it coming. When they’d left the city that morning, they’d driven three hours south in midwinter sunshine, under skies of unbroken blue. Then just out of Cassetown they drove in under a thick dark cloud that filled the whole of the sky to the south, and turned the day dusk-dark. In Cassetown, Geologue Bay, Iris and her extended family — her ex-husband and his wife and their new baby; her son and her best friend’s daughter — gather on a midwinter long weekend, to pack up the family holiday house now that it has been sold. They are together for one last time, one last weekend, one last party. The Hope Fault is a celebration of the everyday complexities of family: aunties and steps and exes, and a baby in need of a name; parents and partners who are missing, and the people who replace them. It’s about the faultlines that run under the surface, and it’s about anxiety and uncertainty — the unsettling notion that the earth might shift, literally or metaphorically, at any moment. It’s a contemporary novel that plays with time and with ways of telling stories. It finds poetry and beauty in science, and pattern and magic in landscape. [The Hope Fault] echoes the thoughtfulness of Jessie Cole’s Deeper Water, with its literary reflection on the geography of family, and the way domestic life can be invaded and divided. Farr uses space, time and sensual experience to pull off some impressive extreme craft sport in this book; the result is a compassionate and affecting novel that explores the play between our internal and external lives. Tracy Farr’s quietly brilliant second novel … is an accomplished, immersive, moving book. Highly recommended. 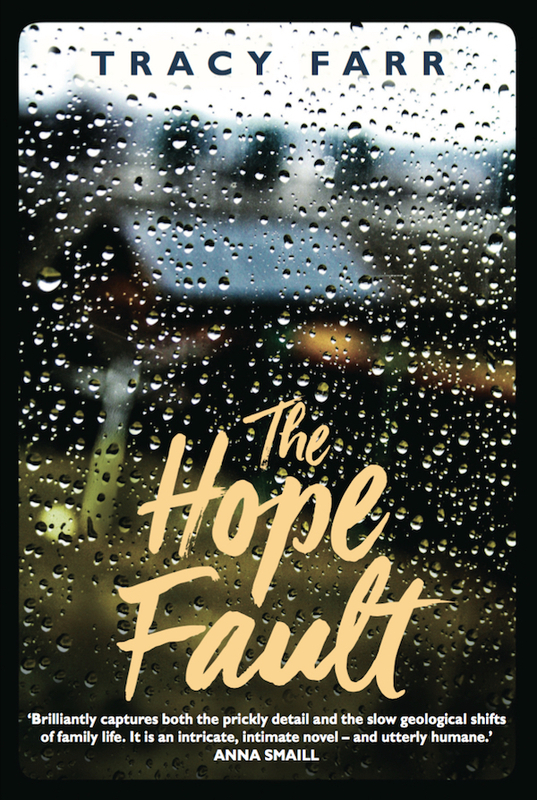 The Hope Fault is published by Aardvark Bureau/Gallic Books in the UK in July 2018, and in October 2018 in US, ISBN 9781910709436 (paperback). Available internationally for purchase direct from the publisher, from Amazon (UK) or Amazon (US), or ask your local bookstore or library to place an order. The Hope Fault is published in print (Australia, New Zealand) by Fremantle Press (2017), ISBN 9781925164404 (paperback). Available now in bookstores in Australia and New Zealand, direct from publisher Fremantle Press, or distributed by Penguin Random House Australia or PRH NZ. Download a sample chapter, book club notes, or media kit from Fremantle Press. The Hope Fault is published as an e-book by Fremantle Press (ISBN 9781925164435), and is available from your favourite e-book platform or direct from Fremantle Press. 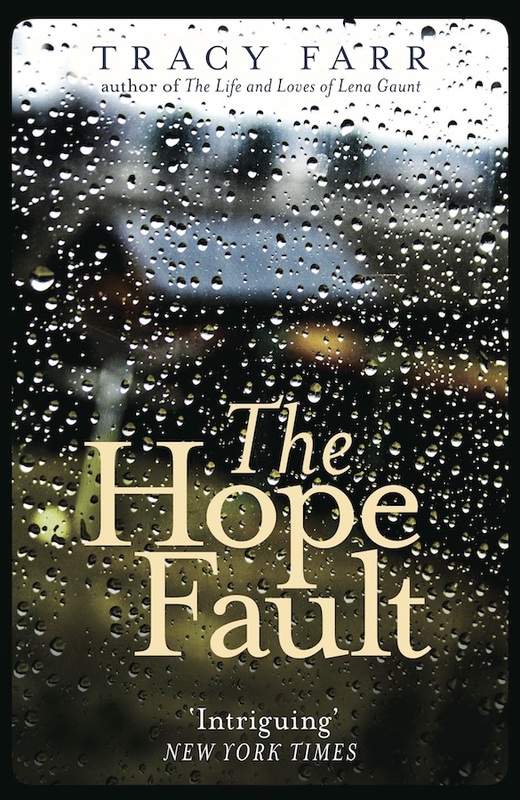 The Hope Fault is published as an e-book by Aardvark Bureau/Gallic Books (ISBN 9781910709443), and is available from your favourite e-book platform or direct from Gallic Books. The Hope Fault will be published in Italian as Dopo la pioggia by UnoRosso/Parallelo45 Edizioni, due out in late 2018, details to come. Take a look at the ‘biblet’ that Aardvark Bureau have put together for The Hope Fault. It contains resources, reviews, audio and video, sample chapters from the novel, and links to buy the book direct from online retailers. Click on the icon below to open the biblet in a new browser window, and feel free to share it on social media.